Teachers are the core of the St. Mark’s community. 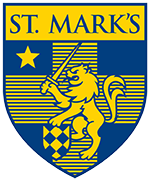 Whether they lead a classroom, inspire an athlete, keep the campus clean and secure, or manage the business of the School, every employee at St. Mark’s is an educator and supports the development of our boys. Ongoing learning, improvement, and growth are essential to continued excellence. When professionals arrive on campus, we must provide a nurturing environment, outstanding growth opportunities, and a community of support. The School is dedicated to sustaining its commitment to great teaching. A. Provide a work environment that is rewarding financially and professionally. Provide faculty salaries that remain generally at or above the 90th percentile for all member schools in the National Association of Independent Schools with over 500 students. Strengthen and expand recruitment strategies to attract the most qualified and diverse candidate pool available. Strengthen and expand new faculty and staff integration programs. Strengthen and expand professional development programs to support continual improvement for all faculty and professional staff. Review regularly faculty and staff benefit programs. B. Strengthen the faculty, staff, and administration evaluation process to encourage continual improvement and professional growth. Design and compose a document that articulates the essential qualities of excellence in teaching at St. Mark’s. Assess and strengthen the current evaluation process to achieve greater consistency across the School. Provide supervisors with professional training in personnel management and communication skills. Explore innovative ways to support the growth and development of faculty, staff, and administration, including but not limited to collaboration, peer coaching, action research projects, summer study grants, online training, off campus projects, etc. C. Improve the sharing of content, lesson plans, and teaching methods. Develop a school-wide system for curriculum management. Expand the use of the School’s internal network resources to increase collaboration among the faculty. Develop a plan to capture and retain course content and faculty teaching methods. Encourage and support teachers to explore innovative teaching methods. Expand the role of the St. Mark’s Master Teachers as campus leaders and mentors. 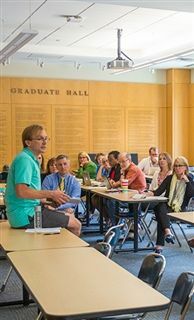 In recent years, as part of the School's August pre-sessional meetings, faculty and staff members have begun hosting "sharing sessions." These presentations cover topics including summer professional development experiences, new pedagogical methods, and training on the School's technological resources. The faculty presentations offered in August 2017 included "The Peer Coaching Model," "The Harkness Table Teaching Method," "Online Gradebook Training & OneNote Integration," and "Focusing on Active Listening Strategies to Enhance Collaborative Writing Skills for Nine-Year-Old Boys." Several teachers shared their experiences traveling abroad, including the Choir Trip to England and the Photography Trip to Bhutan. One science teacher even reflected on the journey she took tracing hemophilia through the royal families of Europe.